It’s been an eventful month since the last time you heard from us. All of us at the Workers’ Action Centre want to thank you for getting involved before, during and after the elections as we did outreach about workers’ rights and how to protect them. Over the past few months, all of your support has made a difference. The fact that a $15 minimum wage was a major election issue means concerns affecting workers are on the table. As you know, Doug Ford, the leader of the Conservative party, was sworn in as Premier of Ontario on Friday, June 29. Last week at his outdoor ceremony, Premier Ford said we all must come together under “the vision of a prosperous Ontario.” It is up to all of us to ensure that Ontario’s prosperity will truly be a shared among all people. Our goal at the Workers’ Action Centre is to make sure workers are included in the wealth that this province has to offer, rather than continue to be left behind with poverty wages. The level of the minimum wage affects workers of all different ages and backgrounds, but increasingly affects adults as this PressProgress report shows. That’s why we’ve been pushing for a $15 minimum wage—to benefit the lowest paid workers, as well as bump up other stagnating wages. The provincial election results revealed that 60% of voters chose candidates that support a $15 minimum wage and decent work. 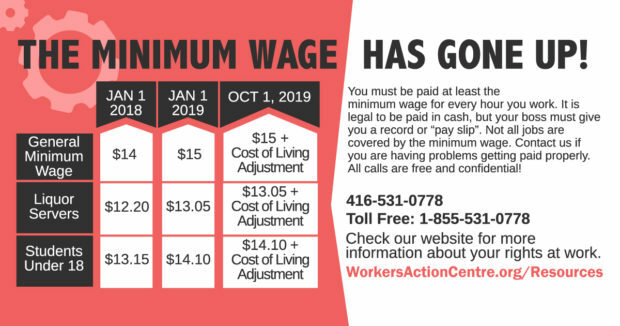 By keeping labour laws as strong as possible, ensuring new scheduling rights and raising the minimum wage to $15 on January 1, 2019, we believe the new government should be accountable to the majority of Ontarians. Click here to download the new Fight for $15 and Fairness petition demanding that the government honour the commitments of Bill 148. You can help send this message to our elected officials by collecting signatures in your community and mailing the petition form back to us. Will the new Ontario government do what’s necessary when it comes to enforcing workers’ rights? Bill 148 sought to boost enforcement by hiring 175 more Employment Standards Officers (ESOs). A Toronto Star article says the “proactive inspections” carried out by ESOs are the most effective at recovering workers’ unpaid wages and addressing wage theft. Currently, the government’s freeze on hiring has now cut the number of new officers short by 100 officers. This has to change and it’s up to us to make sure the full 175 get hired! Workers’ Action Centre organizers and allies know that we have to strengthen our defence of workers’ rights this summer. We continue to offer Know Your Rights workshops in communities across the GTA and beyond. Please contact info@workersactioncentre.org if you’d like to host a workers’ rights workshop for 15 or more people. Your Rights At Work booklets can also be found at WorkersActionCentre.org/resources in English, Chinese, Spanish and Tamil. Share these resources in your community and online networks through Facebook and Twitter. Let’s make sure workers in our communities know what is at stake in the fight for decent work.